Keep your gardening tools, equipment and outdoor items protected and tidy with this premium apex metal storage shed with wood-effect from Waltons. 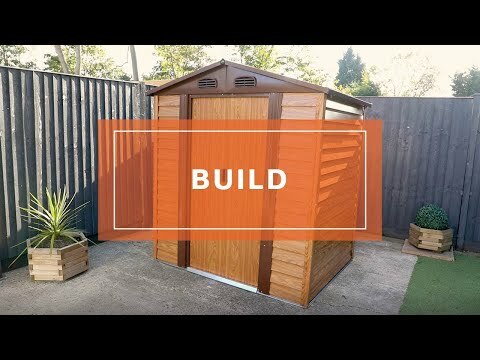 Made from high-quality, low-maintenance materials, this shed is the ideal storage solution and provides a secure space to store away outdoor items. The premium shed features extra thick sliding double doors which offer extra strength, durability and provide ultimate security. The double doors can be secured together with a padlock (not included) through the predrilled holes in the door handles. Made from high strength steel framing and panels, this metal storage unit will keep your items protected and secure with ease. It has a metal reinforced wall column and horizontal panels that ensure superior strength and durability. The low maintenance materials do not require annual treatments or paints and will look great for many years to come. The apex style roof prevents rainwater collecting, protecting the building from weather damage, and the integrated air vents prevent the build-up of condensation, to help keep your items dry. This shed provides enough space for items such as gardening equipment and tools. Thanks to the stylish wooden-effect design, it will not only provide a practical storage space but will also complement the aesthetic of your garden or outdoor area. Available in three different sizes, 5x6'4", 5x7'9" or 7'10"x7'10", so that you can find a shed to suit your needs.